The AFG 3.0 AT folding treadmill is a quiet, powerful machine with an inflated price tag and a limited number of features. The display console features an LED brickyard display with two 4-digit LEDs, 12 digit alphanumeric LED, plus date and time. The 10 programs include Manual, Speed Intervals, Incline Intervals, Mountain Climb, Pacer, HRC 1 & 2, Weight Loss, and Custom 1 & 2. UPDATE: The AFG 3.0 AT treadmill has been discontinued. You can take a look at all of the most popular models for sale here to compare specs and prices. The AFG 3.0 AT folding treadmill utilizes a 2.75 horsepower continuous-duty motor, a 1.6mm thick belt, a 55" x 20" running area, and a top speed of 12 mph. It has a drop-assist deck, which are shocks that help support the weight when raising and lowering the deck. The ProFILE™ performance tracking technology can be used by two different users to monitor stats including time, calories, pace, and distance, and evaluate them with previous workouts. Other features include compatibility for wireless heart rate monitoring, and an input/output jack for an iPod or MP3 player. 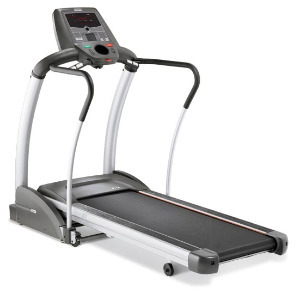 Treadmill reviews by customers on this model are rare but pros are able to get a look at it and have had positive reviews. The AFG 3.0 AT is a solid machine that delivers in terms of cushioning, noise level, power, and quality. 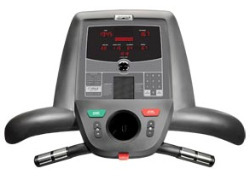 Unfortunately, the asking price exceeds that of competitor folding treadmills by about several hundred dollars. Though it has an MSRP of $1899 at the official website, the AFG 3.0 AT typically sells for around $1,599 at amazon.com. That’s a better deal but it still doesn’t make sense to go with this brand over a Sole or Smooth, or even the Livestrong treadmills which, like AFG, are made by Johnson Fitness, one of the world largest fitness equipment makers. 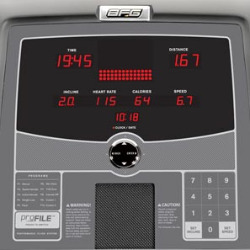 For what you get at the listed MSRP, the AFGs are over-priced, but if you can get a good deal on it, you’ll be happy with the performance of the AFG 3.0 AT folding treadmill.